15 China trip, 2009 - "Partnership with Chinese Unions"
Andy (Andrew) Stern was elected President of the Service Employees International Union (SEIU) in 1996 after being a member and working his way up since 1973. Stern's name was one of the 110 on the White House visitor logs that President Obama released. He visited the White House 22 times between Jan. and July 2009. Stern resides in Washington, D.C. In a Feb. 25, 2009 interview, Stern stated that in 1971, his evenings were dedicated to a group called the National Welfare Rights Organization, which was trying to empower people to get off of welfare through community-worker alliances." The son of a New Jersey lawyer, Stern earned a degree from the University of Pennsylvania in 1971. After "bumming around Europe", Stern took a job in a Philadelphia welfare office newly organized by SEIU. Early on, he became convinced that he and his fellow caseworkers were being sold out by their union's lawyer, who had put the finishing touches on their new contract at a poolside fund-raiser for the lieutenant governor. Stern helped lead a wildcat strike in protest, earning the wrath of higher-ups. "I began to suspect," he later recalled, "that the structure of the union provided the staff with disproportionate authority for decision-making, as opposed to the more democratic empowerment of the members that I thought was in the true spirit of the labor movement." Running as a reformer, Stern soon got himself elected president of the local. Stern began his union career in 1973 as a state social service worker and activist member of SEIU Local 668, the Pennsylvania Social Services Union (PSSU). He rose through the ranks to become the first elected full-time president of PSSU and in 1980 was named at age 29 to the SEIU International Executive Board. In 1984 he was recruited by John Sweeney to oversee SEIU's organizing and field services programs. Andy was elected SEIU International President in April, 1996, to succeed John Sweeney, and has led SEIU to become the largest and fastest growing union in the AFL-CIO with over 1.6 million members. In 1996 Andy Stern, was one of the original 130 founders of Campaign for America's Future. In 2005, frustrated with the pace of reform in the AFL-CIO, Stern led SEIU and six other unions out of the labor federation to form a new coalition called Change to Win. Andy Stern serves on the Board of Directors of the Economic Policy Institute. Service Employees International Union (SEIU), Washington DC - Andy Stern, Anna Burger & Judy Scott. 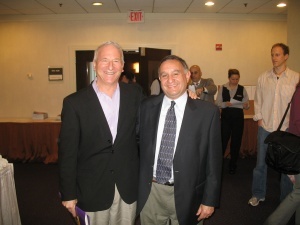 In May 2008, Stern met Demos President Miles Rapoport. 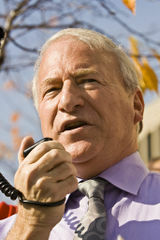 In 2009 Andy Stern President, was listed as a signer of the Progressives for Obama website. In 2009 Andy Stern was listed as a member of the Advisory Board of Wellstone Action, a Minnesota based organization based on the political legacy of that state’s late ‘progressive” Senator Paul Wellstone. In 2009 the ACORN Outside Advisory Committee comprised of John Banks Vice President of Government Relations Con Ed, Dave Beckwith Executive Director, Needmor Fund, Henry Cisneros Executive Chairman, Cityview, Eric Eve Senior VP of Global Consumer Group, Community Relations, Citigroup, Harvey Hirschfeld President, Lawcash, Kathleen Kennedy Townsend Board Member, RFK Foundation, former MD Lt. Governor, John Podesta President and CEO, Center for American Progress, Andy Stern International President, Service Employees International Union. As at Jan 28, 2010 Andrew Stern was on the Board of Directors of The Organizers' Forum, a group with the mission of strengthening grassroots organizations by increasing capacity and stability of their democratic structures, to link organizing networks, and to improve on the skills and strategies employed by both community and labor organizers. Deepak Bhargava, John Calkins, Tho Thi Do, Mary Gonzales, Ken Johnson, Michael Kieschnick, Drummond Pike, Mark Splain, Andy Stern, Pat Sweeney, Mary Rowles, John Hoyt, Gustavo Torres. China trip, 2009 - "Partnership with Chinese Unions"
Kent Wong's UCLA Labor Center participated in a historic meeting between the Change to Win federation and the All China Federation of Trade Unions in August 2009. An agreement signed by CtW Chair Anna Burger and ACFTU Vice Chairwoman Sun Chunlan at ACFTU headquarters in Beijing promotes cooperation between the two federations on key projects, such as joint research on multinational corporations operating in the United States and China. It was the first time in history that such an agreement has been signed between trade union federations in the two countries. The UCLA Labor Center pledged work with SEIU and the Teamsters, as well as with ACFTU, to conduct research on labor standards, labor law enforcement, and collective agreements in the multiservice, express delivery, and commercial banking industries. In late 2010, the Labor Center will participate in a binational US-China conference, hosted by the ACFTU, to explore ways research findings can improve labor standards. In Beijing, Andy Stern and Kent Wong met with faculty members from the Labor Relations College of Renmin University and also visited the Migrant Workers’ Center. In addition to Anna Burger, the US delegation included SEIU President Andy Stern, CSEA Executive Director Josie Mooney, Ginny Coughlin from SEIU, and UCLA Labor Center Director Kent Wong. Labor Center staff member Scott E. Myers served as the delegation’s Chinese interpreter. Stern has worked to increase labor's voice in pension fund investments as co-chair of the Council of Institutional Investors. President Obama appointed Andy Stern to his commission to reduce the deficit, the National Commission on Fiscal Responsibility and Reform. In one measure of Mr. Stern’s proximity to power, official records show that he visited the White House more than 20 times during Mr. Obama’s first six months in office. This page was last modified on 30 December 2018, at 14:26.